Inexpensive can be just as effective! I have always been a budget shopper and that will probably never change! I almost ALWAYS keep my nail polish budget to $2 or less a bottle. Yup - told you! :) Well, I was enticed by the idea of an "all in one product." However, for the "extra" money I spent (the bottle was around $7) I wasn't all that impressed. I painted my nails Saturday and within 5 days, the edges were chipping. 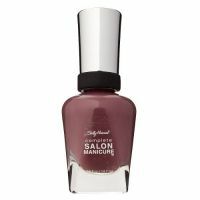 This product h...read moreas a base and top coat in it (how they do it, I have no idea!) but it didn't last. After I painted my nails, I debated on applying a top coat anyway, but really wanted to test the product as it was designed to be used. As a result, I will definitely apply a top coat (or two!) next time, or better yet, buy NYC polish for less and apply a top coat and have it last 7 days. I also thought the formula was a bit thin. I bought Commander in Chic, which is a pretty taupey color, and it required 2 heavy coats for coverage. The luxury of painting my own nails stopped when I became handicapped due to multiple sclerosis. I have a girlfriend now clip and paint my nails for me which is quite generous of her. This all in one polish is a wonderful find to do that and I am very grateful to not have to worry about a base coat or a topcoat as well as the color. It lasts as long as a more expensive brand but then again I no lo...read morenger have the same ability for physical activity. For a drugstore brand, this is not only within budget constraints, but it is also awesome. There are many colors to choose from and if you have time limits this polish is convenient. Unless you have a lot of time to dry your nails thoroughly (and when I say thoroughly, I mean give it 40 minutes! ), I recommend skipping this "all-in-one" product. It chipped way too easily (not even the most inexpensive polish I use chips!) and was so badly scuffed up after a few days that I have no idea how SH can claim this is a 10-14 day wearable polish. Normally I am a big fan of SH products,...read more but this one is not one I can recommend to anyone. If you're going to spend the money on this, you might as well get a bottle of OPI, China Glaze, or Essie and at least that will give you the quality you're looking for.